Pēteris Sproģis generally builds excellent small vehicles, but lately he has been building larger ones and they do not disappoint either. His Shelby Mustang recently won the 75th LUGNuts challenge and he has now built a superb rendition of Toyota’s FJ Cruiser. 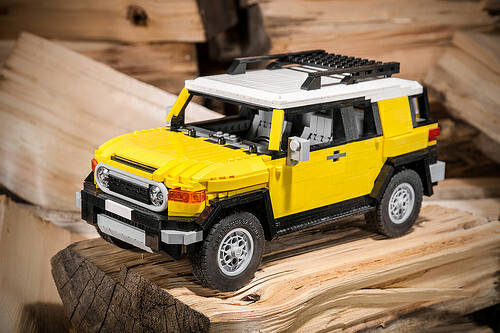 Toyota’s orginal FJ Land Cruiser set a new standard of reliability for off-road vehicles, practically replacing the traditional Land Rover in Africa, whilst in the US it gained a bit of a cult-following. The FJ Cruiser is a modern interpretation of this classic, with similar off-road performance and with retro styling. I don’t think it’s a particularly pretty car, but compared to other Toyotas, which are about as interesting as wet spaghetti, it is distinctive. When building a model of a car with distinctive looks, like the FJ Cruiser or a Hummer or VW Beetle, you can mess up the proportions pretty badly before it will no longer be recognizable. However, Pēteris’ model is just about perfect.